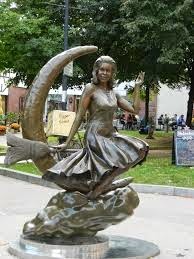 Salem, MA has long been associated with witches due to the infamous 1692 witch trials. In October 2013 we did the unthinkable and asked our daughter to take us to Salem on the final Sunday before Hallowe'en. (Click HERE for that post.) We've since learned locals avoid Salem during October because of the throngs of people who descend upon the area (often donning witches hats and carrying brooms) determined to tour the Witch House, Wax Museum and other scary establishments. Nonetheless touristy Salem is a fun place to visit as it has everything 'witchy'...including Samantha Stephens of television fame! What few tourists realize, however, is the actual witch trials and hangings took place far from the coast and occurred in what is now modern day Danvers. Imagine our surprise when we learned the meeting house, church and farmsteads of accused and accusers were within walking distance of our daughter and son-in-law's home. We had to check it out. First stop was the Rebecca Nurse Homestead. Rebecca Nurse Homestead, Danvers, MA. In 1692 71-year old Rebecca Nurse was accused by her neighbour of being a witch. Friends and family begged her to leave before the authorities arrived, but like the other 18 accused she refused and was tried, convicted and hanged in July of that year. Of the original 300 acres owned by the family in the 17th century, 27 acres are preserved much as they were back then. The homestead includes the family cemetery that is a short walk from the house (hidden in the line of trees in the distance). Being a witch, Rebecca was refused a Christian burial. Her son risked his own life to dig up her body in the middle of the night and re-bury her remains on the family farm. No one knows where exactly, but it's unlikely she is in the family plot as that would be the first place anyone would look. The trials took place in the meeting house which was a few blocks away. Long before the US Constitution was written a person accused of being a witch could not defend themselves nor have anyone speak on their behalf. It was simply a matter of being accused and allowing the powers that be to decide on the appropriate punishment. In 1702 the meeting house was abandoned, dismantled and re-located to this site "until the lumber decayed and mixed with the soil". A memorial to the accused marks the spot. Close by was the Salem community church. While the structure on site today is not the original nor of the same denomination, the architectural style is true to that time period (note the one-storey, simple construction). The size of the large tree John is standing in front of (below) makes me wonder if it was planted shortly after the trials ended. Perhaps it served as a sobering reminder of the insanity that tore this once serene community apart. The church and meeting house where the trials took place may be gone, but other homes survive. The woman who accused Rebecca Nurse of being a witch lived in this house (above). The two women may have been neighbours, but they were hardly best friends. The problem began when Mrs. Holten's pigs wandered over to Rebecca's property. Perhaps they ate some vegetables or trampled crops, but Rebecca returned them, and warned next time they'd end up in a pot. When Mr. Holten died a short time later, Mrs. Holten blamed Rebecca and accused her of using the return of the pigs as a diversion to cast a spell on her unsuspecting husband. Other homes still standing include this one dated 1681. It was owned by innkeeper Thomas Haines. While the front has been painted, during the witch trials all exteriors were left natural as shown on the side of this home. On our way home we passed by this cemetery. Down the street we passed this home decked out in all its Halloween finery. Do you see the electric chair? Have you visited Salem? The real Salem?! 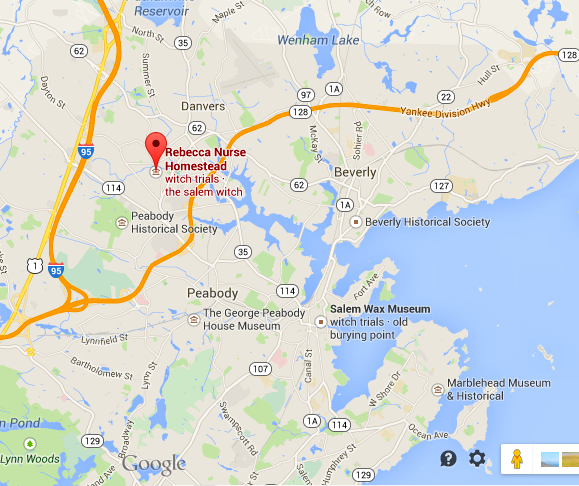 Either way there is SO much history in the Boston area it's definitely worth a visit (or two or three or four).